The International Journal of Water Governance (IJWG) aims to be an important source of knowledge on governance in the domain of water and water related issues, and an inspiration for professionals to understand and improve the governance capacity in their domain(s). In order to achieve this two-sided ambition we combine urgent theoretical issues of governance, institutions, organizations and management with urgent issues of water supply and flood protection. 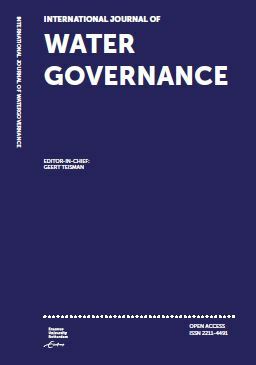 From a variety of disciplines, we are gathering insights on what constitutes the governance capacity with regard to water quality, flooding or scarcity. The scientific domains we cover in IJWG are public management, law, sociology, economics, planning, environmental sciences, risk management and innovation studies. Furthermore, we urge for contributions that combine disciplinary contributions in order to achieve an interdisciplinary approach of water governance. We expect that professionals in the field can play an important role in these processes of transforming high quality disciplinary knowledge sources into integrated knowledge leading to innovations and improvements in water governance systems all over the world.